Berlin communications company AVM has released its new VDSL wireless router in the shape of the FRITZ!Box 7490. 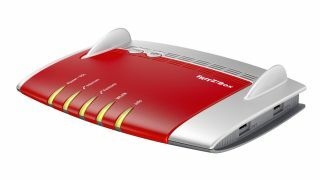 The FRITZ!Box 7490 is a speedy customer, arriving in shades of go-faster red and providing built-in transfer rates of up to 1.4Gbps over fibre-optic broadband connections. The router supports Wi-Fi on the 2.4 GHz and 5 GHz bands thanks to compatibility with the latest 802.11ac standard, in addition to 802.11 a/g/b/n. Incorporating a telephone system with answering machines, the FRITZ!Box has an integrated DECT base station with up to six cordless telephone connections. AVM has also added support for calls in HD quality as well as options for analogue, ISDN and IP based telephone types. Equipped with four Gigabit LAN and two USB 3.0 ports, the FRITZ!Box 7490 can also act a media server for music, pictures and videos, with easy access to shared files across the entire network. Arriving with pre-installed encryptions for wireless LAN and DECT, updates to the router's security will be regular and free of charge. Options for parental control, the synchronisation of contacts, Wake on LAN and WiFi telephone calls to smartphones are all features of the FRITZ!Box's FRITZ!OS operating system. Guests and friends will also be able to use the router through its wireless hotspot feature. The new FRITZ!Box 7490 is available immediately in Europe for a recommended retail price of £237.